Poutine, to me, is the ultimate Canadian comfort food and guilty pleasure. 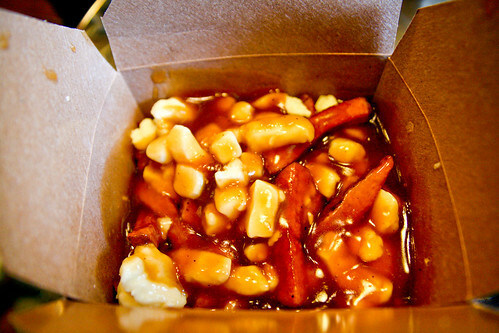 Originating in Quebec, poutine is a street food consisting of fries, fresh cheese curds and brown gravy. It is so bad for you, yet sooo good! Poutine has actually begun to spread outside of Canada as I have actually had two poutine experiences in Pittsburgh. However, creating good poutine requires a bit of science. Believe it or not, poutine isn't just a random mixture of a random quantity and type of fries, cheese curds, and gravy. The best fries for poutine are fresh and of medium cut - not too thin, not too thick - and crunchy on the outside while soft on the inside. Soggy fries don't cut it! The brown gravy or sauce is usually chicken-based (though there is some variations on that as well), a little spiced, and a little salty. There is nothing more disappointing than gravy that's bland, like one vegan gravy I've had that was simply tasteless. Also, in my opinion, there should be enough gravy for the fries to swim in it. I mean, it's poutine, for crying out loud; if there's not enough gravy in it, it's just fries. Finally, there must also be plenty of cheese curds, which must also be squeaky fresh (not more than a day old). Photo of a traditional poutine that I took two years ago at Smoke's Poutinerie. Up until 2008, poutine was mostly served in diners, fast food restaurants, and food trucks in the Toronto area as one of the side items. 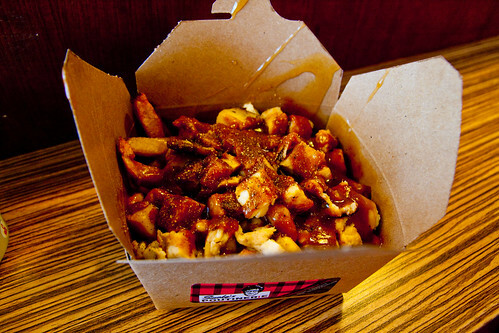 But that all changed when Smoke's Poutinerie opened its first restaurant completely dedicated to poutine on Adelaide Street in the Entertainment District of Downtown Toronto. The poutinerie idea was an instant hit, as evidenced by the opening of Smoke's competitor, Poutini's (which I've yet to try but it supposedly boasts the squeakiest cheese curds in the city! ), as well as the fact that Smoke's has already expanded to 12 locations in less than three years, with four more coming soon across the Eastern half of Canada. I stopped by the original Adelaide location last Wednesday for lunch. (Huge line-up, by the way!) Smoke's has expanded their menu a bit since my previous visit a while ago, and now serves 23 different kinds of poutine, from the traditional poutine to three different vegetarian poutine to the very meaty "Hogtown" poutine. The reason I like Smoke's is that, in addition to exacting the science of making a solid poutine, I appreciate the creative ways they "dress up" their poutine - there is always something for everyone. With so many varieties, it wasn't easy to decide on what to order, but I eventually settled on a regular serving of the Curry Chicken Poutine, with grilled chicken and a mild curry sauce. I added some ground pepper but held off on the Sriracha sauce, Heinz ketchup, and Heinz vinegar which were some of the condiments available at the counter. It was a solid poutine with everything done just right, and the curry sauce was definitely a nice twist on the traditional poutine. With so many different kinds of poutine, Smoke's is one of those places that makes you want to go back to try them all. I am already plotting my next visit!